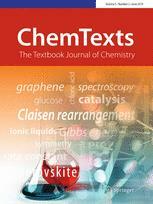 This online journal publishes texts for academic education in chemistry and biochemistry, with the aim of imparting contemporary knowledge to students at an exceptionally high didactic level. Typical texts offer self-consistent treatment of a topic which could be part of a textbook. These are thoroughly illustrated and may also include such supplementary material as animated presentations or videos. The range of topics spans traditional areas of chemistry, such as organic, inorganic, and physical chemistry, plus analytical chemistry, technical chemistry, environmental and green chemistry, food chemistry, theoretical and computational chemistry, biochemistry and chemical biology. It also includes material in the rapidly emerging areas of nanotechnology, energy and security. The peer-reviewed texts mirror the current state of knowledge, offering genuine improvements over existing textbook material.